The tenth anniversary of the ACM Symposium on Eye Tracking Research & Applications (ETRA 2018) took place at Warsaw, Poland. 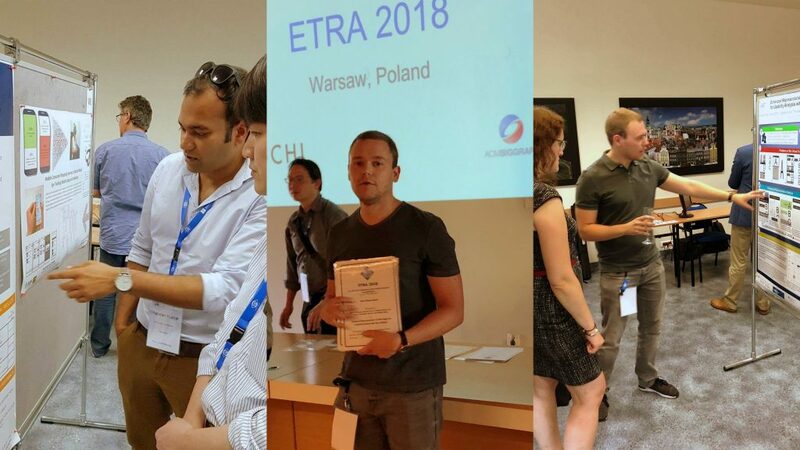 The partner’s from Institute for Web Science and Technologies (WeST), University of Koblenz, presented ‘one conference talk’ for a research paper, and ‘two demonstrations’ for video submissions for which they also received the best video award at ETRA 2018. The research paper discusses the future of eye tracking usability analysis of modern Web pages through “Enhanced Representation of Web Pages “, where a method that identifies fixed elements on Web pages and combines user viewport screenshots in relation to fixed elements for an enhanced representation of the page. The respective video submission demonstrated the applicability of the approach. The other video was focused on the interaction mechanism for multimodal browsing with gaze and voice input. Since, the applicability of gaze and voice input is subjective to the factors of user preference, context, accuracy and the performance of individual modality. In this work, we aim to neutralize these factors for a true hands-free experience: integration of the two modalities for a wholesome Web browsing experience.